The Swan Close, a photo by Woodlanda on Flickr. This pub on Poole Quay is, in my view, the best of the tiled pubs in Poole. This photo was taken in the late seventies when it was still a pub. The tube lined panels were made locally by Carters and Co. They have been covered up for some time by the current business, an Enid Blyton themed activity centre. I’ve just learned that this will be closing at the end of next month so I wonder what will happen next to this building. Will the swans come out from hiding? It is next to the remaining outlet for Poole Pottery so I’m thinking that the most fitting solution would be if they could see their way to using this fine example of ceramic art as part of their Poole Quay presence. Putney tile centre, a photo by Woodlanda on Flickr. Usually what impresses me in a tile is the design, the glaze or the moulding. Though these are all present and correct in this example, from a street in Putney, the more I look at it, the more impressed I am by the skill shown in the actual tiling. Sometimes we are able to identify who designed a tile or the firm who manufactured it. It would be practically impossible, I imagine to know who was responsible for cutting out all the angles and setting all the border tiles together with such skill. And he didn’t just have to do it once, this is one of a series of pilasters in a row of shop fronts. I wonder what he thought of the architect or whoever had the bright idea of featuring the tile on the diagonal. Salisbury delft glasses, a photo by Woodlanda on Flickr. This tile is part of a fire surround in an old building in Salisbury. I’m not sure if the blurry effect is the fault of the photographer or the underglaze colour spreading slightly. There are quite a few different designs in the surround, mostly blue but some brown. I liked this one showing what I presume to be a very early optician showing his spectacles. In the days when images were much less prevalent than now these little scenes of daily life and landscapes must have been valuable diversions on the dull winter evenings around the fire. 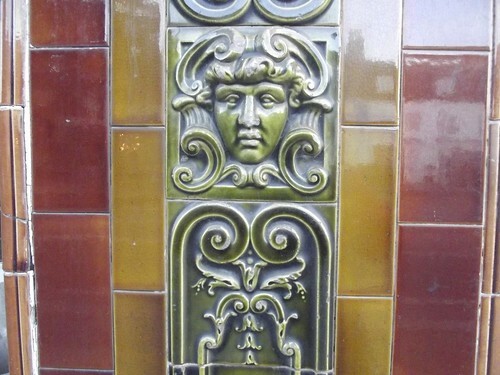 Esher tiles face, a photo by Woodlanda on Flickr. Just got back from a weekend stay in Esher where I took the chance to photograph these tiles in Esher High Street. They form a pilaster repeated along a row of shop fronts. I don’t know the manufacturer but the style, glaze and the detail of the modelling seem to me very similar to the Carter’s tiles I have studied in Bournemouth and Poole. While I was taking the photos the owner of one of the shops came out. He complained that his neighbouring shop had just painted over some of the tiles and he had to replace some which had worked loose on the edge. Joseph Cutler, a photo by Woodlanda on Flickr. Well the time is nearly here when I will be taking a group on a tour around the tiles of central Bournemouth as part of Dorset Architectural Heritage Week. So here is a photo of one of the highlights, a very unusual, possibly unique concept. The Victorian gent here portrayed is Joseph Cutler, one of the early developers of Bournemouth. When he built this terrace in the early 1880’s he decided to feature his own portrait in painted tiles on each pilaster. Gaunts House 014, a photo by Woodlanda on Flickr. This terracotta head gazes out from the facade of Gaunt’s House at Hinton Martell near Wimborne, Dorset. The house was rebuilt in 1886/7 and is currently used as the base for an alternative community. There are also terracotta relief plaques and balustrades at the edge of the roof. Lucullus Casserole, a photo by Woodlanda on Flickr. It was one of those moments. I could hardly believe it when I saw this classic 1960’s Poole Pottery casserole dish on a table in the shop at my local tip. I had been looking at an illustration of it on the flyer for the book about Robert Jefferson, on my kitchen notice board for a while. Jefferson worked as a designer at Poole from the late 50’s to the mid 60’s and is responsible for many innovative designs. This casserole was one of the early examples of oven to table ware. Sadly, its condition is not perfect as there is a light chip on the rim. But for 50p I’m not complaining.